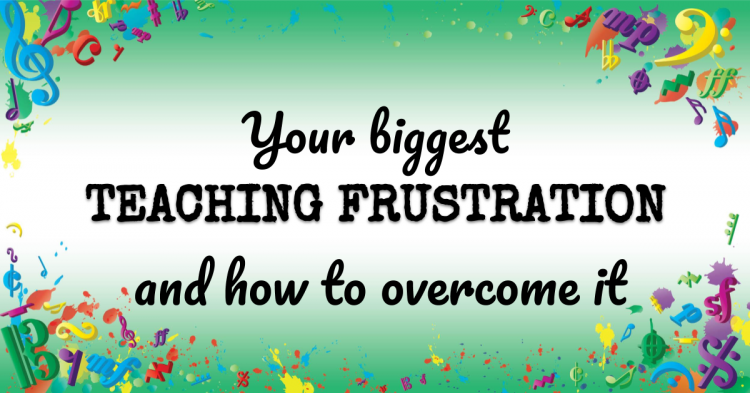 What’s your biggest frustration as a music teacher? That’s a question I ask all readers of the Colourful Keys blog and in this episode I want to help you with the most common one. This is Episode 22 of the Vibrant Music Teaching podcast. I’m Nicola Cantan and today I want to talk to you about your biggest frustrations as a teacher. Welcome! Beautiful teachers today I want to talk to you about your frustrations. And know I’m not a mind reader obviously but I sort of am. You see when people subscribe to the e-mails from colorful kids about latest blog articles and these podcast episodes and that kind of thing I ask new subscribers about their favorite thing about teaching and their biggest frustrations. I love getting these e-mails. I read every single one. I don’t always get the chance to reply but I reply to as many as I possibly can because I love reading them. It’s really interesting to see how teachers all over the world share the same frustrations and the same favorite parts. The favorite part almost always is some variation of that moment when students get those light bulbs when something just clicks or people talk about how they love spending time with kids and spending all day working with children is wonderful. But the frustrations also have a lot in common with each other too. And really the frustration split into three groups for me students not practicing, students not practicing well and then other which is a whole host of other stuff. But the vast majority of these frustrations lie in those first two camps students aren’t practicing at all. That’s probably the biggest one. Or students are not practicing well, they’re not practicing efficiently. I want to read out a few quotes from these e-mails to you so you can get a sense of what teachers like you and like me are feeling about practice. I’m obviously not going to use the names here. These are e-mails so the people do not attend them to be broadcast on a podcast. So these will be anonymous but I think they give us a great insight into yeah what teachers around the world are feeling and how we’re not in this alone. We’re all feeling the same frustrations. So the first one said by saddest frustration is not being able to motivate my students to invest in daily practice. Another teacher said half of my students practice no problem. The other half I’ve tried charts and a reward system. And it was fun at first but it wore off. I have a view that would move so much more quickly through their books and learn so much better if they’d only put in the time. Another teacher said my biggest teaching frustration now is that piano often takes a back seat in families busy lives yet another one said my biggest frustration with working hard on a piece and then they don’t do anything in the in that week and the next week we’re working on the exact same thing. So I have loads of these and I want to talk to you today about a few different ways we might address these issues. I’m not going to solve your students practice problems that is impossible. And it’s certainly not going to be done just through me talking to you on a podcast. But I think there are a few adjustments we can make. So this isn’t such a big frustration for us. The biggest thing for me is that this needs to be established from the beginning and I’ve said this many times and it’s frustrating. If it wasn’t established from the beginning to try to move forward from there. But I think this is the first thing you can do resolve with new parents to have this discussion straight out and to their face before they joined your studio. Tell them what is required of you piano lessons in your studio what it means to take piano lessons. How you’re there to support them. But it is on them to make practice happen at home. Now what I don’t like and I’m sorry is the word requirement there. What is required. Because I don’t like this idea of a contractor required to do this much to stay in my studio. I don’t think of it like that. But I do think it’s very important and it’s our responsibility to make it clear to parents that if their child does not practice from the beginning it’s going to be impossible to get them to practice later. Not impossible, very difficult and it’s always going to be a battle if it isn’t a habit from the beginning. And second of all if they don’t practice and therefore practice from the beginning it is going to be very hard for them to make progress. It’s as simple as that. And we know it. And sometimes we do get frustrated at parents when actually they just don’t even realize that that’s what’s happening. You know they participate in sports and dance and all these other things where you don’t need practice to make good progress. You show up each week and that’s it. The kid does the class go home. Maybe they play around with stuff maybe they don’t. It’s not such an inbuilt part of the system. And I know there’s arguments for treating piano like that too and I’ll address those in a second. But just just assume for now that we do want to get our students to practice on a regular basis whatever that means to us whether that’s three times a week five times a week whatever that we do want that to happen and that’s our intention for every student. They were joined my studio in connection with another parent and I only spoke to one of them or some situation happened where I didn’t face to face with them say listen this is her practice work. So that’s one side of it. The other side of it is to just give up on the practice. And I talked about this in a blog post on the Colourful Keys site it might be a little bit controversial but I think it’s so much better than you being frustrated by a lack of practice from chronic non practices who just see this differently their parents see this differently and it is not going to happen incentives charts reward systems they are not going to help that child because they’re not intrinsically motivated to do it because the habit isn’t there because of so many reasons because the environment isn’t set up for them. So if that’s the case I want to encourage you to treat their lessons a little bit differently. And I have a great quote to share with you from one of these e-mails. Great insight from another teacher. She said I have a number of parents who want their kids in piano lessons but they don’t see practice as being a priority. It’s almost like they want kids to have a music education which is important of course but without any sort of homework attached kind of like soccer practice or swimming lessons you go and you do it and then you don’t do it for another week instead of fighting against this because in a lot of situations this is just the way it is now. I’m challenging myself to teach within the reality of no practice. We have lots of resources that give us ideas about how to motivate students to practice. But if their parents really don’t care it’s all moot. And for the most part I really agree with this blog reader who was writing in to me there it is all irrelevant if you have a young child who is not practicing let’s say under 10 they’re not practicing. The parent is not on board with getting them practice or they say they will be but they’re just very scatty or they have a lot going on or it’s just impossible. OK so you’ve two options now you can use three OK you can kick that child out of your studio. I don’t agree with doing that. I feel like they should still get a music education even if it’s not the way you expect it to look or I expect it to look. Option two is each week you nag nag that child and you stack your charts and use whatever. But ultimately they probably won’t work because the parent is not doing it alongside you or you can just treat those lessons as music lessons not piano lessons they’re going to learn better piano. But each week is a lesson and that’s it until they come the next week. You can do so much with this format. You can explore composing with them. 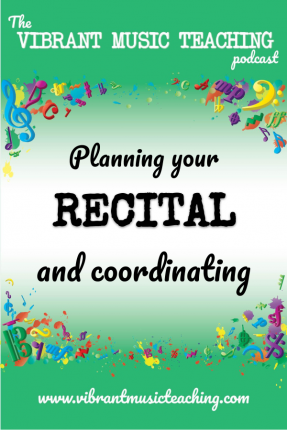 You can learn different bits and pieces of pieces you can learn about notation slowly but you can’t expect it to look like they have three to five pieces. And next week you take off at least 50 percent of them and move on to do it. That is not going to happen because they’re not practicing and that’s just the reality. I agree with her there. That’s the reality. That’s how it is with some of these kids. No don’t give up. At the very first hurdle. But if you have gone on and on with this parent tried to get them on board made it clear what the repercussions are for not practicing in terms of the progress they’ll make and their investment in lessons and all of that. If you’ve done all of that then you’re only causing yourself stress. So stop it. Start enjoying their lessons instead. Thanks so much for listening to this podcast today. If you’re listen to this episode just as it goes live. Then there’s still time to sign up for my next webinar. You can go to vibrantmusicteaching.com/sight that S I G H T because it’s about sight reading. And I will see you live or on the replay so if you’re listening within a few days of this going life then hop on over there and sign up today. The above audio transcript of “VMT022 – Your Biggest Teaching Frustration and How to Overcome it.mp3” was transcribed by the best audio transcription service called Sonix. If you have to convert audio to text in 2018, then you should try Sonix. Transcribing audio files is painful. Sonix makes it fast, easy, and affordable. I love using Sonix to transcribe my audio files.